Many cities and towns across the country are experiencing notable demographic shifts as immigrant groups move to the U.S. and establish new families and communities. 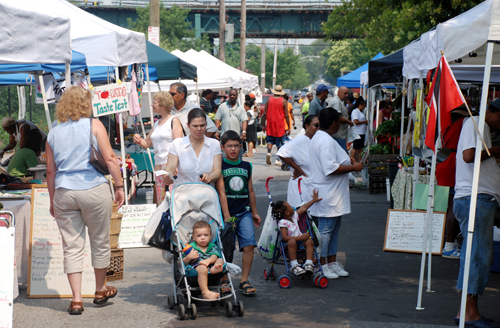 Public markets have often been the most socially diverse public places in a community, bringing people of different ages, genders, races ethnicities, and socioeconomic status together around the experiences of food, shopping, music and conversation. While markets vary in their degrees of social interaction, few are homogenous and many are represent the diversity of 21st century American communities. Many of the markets awarded funding from PPS, through the W.K. Kellogg Foundation grant program, were located in communities with growing immigrant populations. Market organizers saw an opportunity through their markets to bring together different and new members of the community. They developed strategies to create spaces of inclusion by having non-English speaking individuals on their staff, recruiting new growers from immigrant communities, and transformed their market spaces into places where cultural barriers were dissolved, marginalized residents were empowered and differences were celebrated. Increasing cultural diversity became an asset that brought new products, customers, vendors and social programming to their markets.